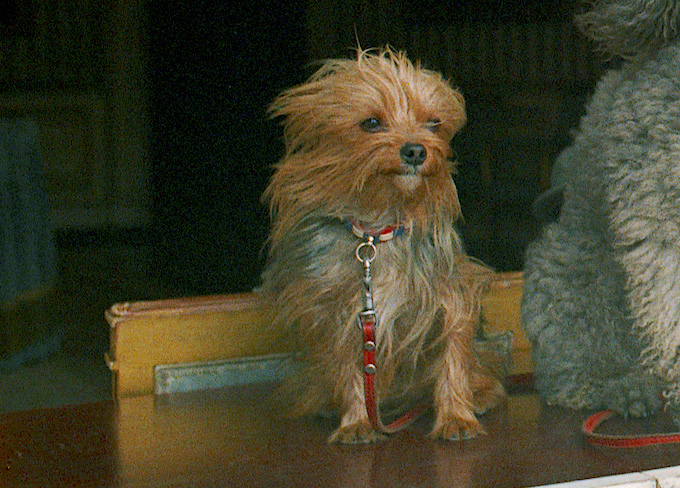 Pasha, so far the only known Yorkie presidential pet, peers out of a window at the White House, Dec. 1, 1970. 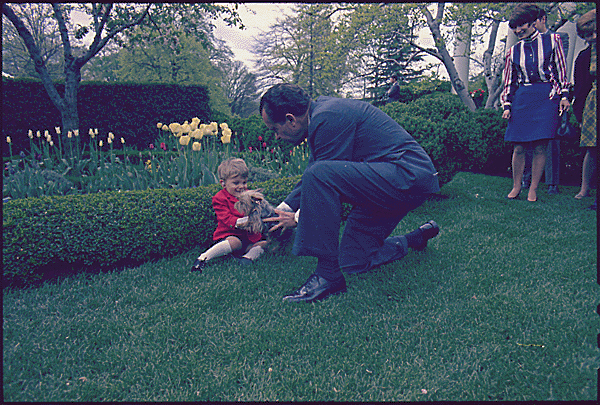 Pasha, a Yorkshire terrier, belonged to Tricia, one of President Richard Nixon’s daughters. When Tricia first saw Pasha, she immediately fell in love. Pasha spent much of his time with Tricia Nixon, but was spotted with President Nixon or his wife, Pat, on several occasions. In 1968, Pasha was with Nixon at the celebration of the 30th anniversary of the March of Dimes. Shortly thereafter, Nixon announced that he would be running for president. 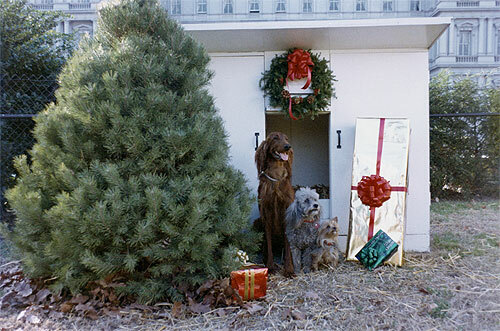 From left to right, King Timahoe, Vicky, and Pasha “wait for Santa” outside their kennel, Dec. 9, 1970. During his time in the White House, Pasha enjoyed spending time with the family — which included his much bigger brother, Irish setter King Timahoe. These two could often be spotted playing together in their kennel outside the West Wing or on the White House lawn. Vicky, the French poodle, would engage in some outdoor play as well, but she was more fond of trying to catch goldfish out of a small pond in the gardens. President Nixon and Pasha meet with David Lupi, the poster child of the National Hearing and Speech Foundation, 1969. In early 1974, Julie Nixon Eisenhower, 25, published a children’s story about Pasha — then 6 years old — in the Saturday Evening Post. Her story was titled “Pasha Passes By,” and it imagined “a brief and unsatisfying exploration of the White House” after Pasha escapes from his kennel, according to the Associated Press. The Associated Press said the short story launched a new career in writing for the young author. 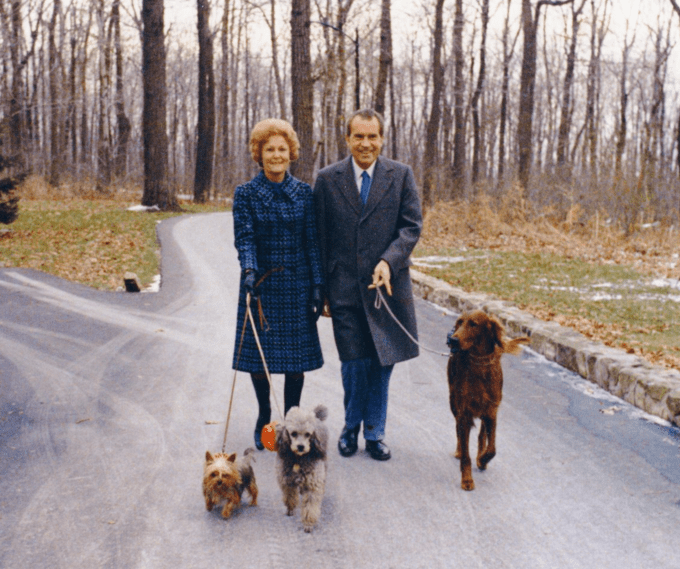 The Nixons walk their three dogs at Camp David, November 1973. Pasha is on the left. After the Watergate scandal and Nixon’s subsequent resignation in August 1974, the family — dogs included — returned to their home in San Clemente, California. Thanks for giving us something Presidential to smile about!